Objective To determine whether observable changes in waiting times occurred for certain key elective procedures between 1997 and 2007 in the English National Health Service and to analyse the distribution of those changes between socioeconomic groups as an indicator of equity. Design Retrospective study of population-wide, patient level data using ordinary least squares regression to investigate the statistical relation between waiting times and patients’ socioeconomic status. Setting English NHS from 1997 to 2007. Participants 427 277 patients who had elective knee replacement, 406 253 who had elective hip replacement, and 2 568 318 who had elective cataract repair. Main outcome measures Days waited from referral for surgery to surgery itself; socioeconomic status based on Carstairs index of deprivation. Results Mean and median waiting times rose initially and then fell steadily over time. By 2007 variation in waiting times across the population tended to be lower. In 1997 waiting times and deprivation tended to be positively related. By 2007 the relation between deprivation and waiting time was less pronounced, and, in some cases, patients from the most deprived fifth were waiting less time than patients from the most advantaged fifth. Conclusions Between 1997 and 2007 waiting times for patients having elective hip replacement, knee replacement, and cataract repair in England went down and the variation in waiting times for those procedures across socioeconomic groups was reduced. Many people feared that the government’s NHS reforms would lead to inequity, but inequity with respect to waiting times did not increase; if anything, it decreased. Although proving that the later stages of those reforms, which included patient choice, provider competition, and expanded capacity, was a catalyst for improvements in equity is impossible, the data show that these reforms, at a minimum, did not harm equity. We examined patient level, national hospital activity data for day cases and inpatient cases in England from 1 January 1997 to 31 December 2007. The Dr Foster Unit at Imperial College London processed and cleaned the data before passing them to Dr Foster Intelligence in an anonymised form. We examined three common, high volume elective surgical procedures that all had chronically long waiting times: knee replacement (OPCS4 codes W40.1, W41.1, and W42.1), hip replacement (OPCS4 codes W37.1, W38.1, and W39.1), and cataract repair (OPCS4 code C71.2). We looked at non-revision cases for all three procedures. Observations were limited to patients seeking elective care from their usual place of residence. Observations were excluded if they had any missing data fields—for example, if the month or year the patient was treated, the patient’s deprivation status, or the patient’s age was missing. No correlation existed between missing data and area, deprivation, year, or patient’s age; any missing data seemed to be the result of coding errors, which were random. We also excluded observations for which a patient’s waiting time was greater than three years. We assumed that any case with a waiting time greater than three years was atypical and should not be reflected in a macro analysis of waiting times. The data retain individual patients’ postcodes (which are removed before delivery to Dr Foster Intelligence). This allows observations to be linked to patients’ local area characteristics. We calculated deprivation by using the 2001 Carstairs index of deprivation at the output area level and broke the level of deprivation into population fifths. The Carstairs index of deprivation is a composite deprivation index based on car ownership, unemployment, overcrowding, and social class within output areas, calculated by the Office of National Statistics.7 The Carstairs index serves as our proxy for patients’ socioeconomic status. In our study, deprivation 1 was the least deprived fifth and deprivation 5 was the most deprived fifth. Waiting times were measured as the time from when the patient was referred by a specialist for surgery to the time the patient actually had surgery. We thus measured time from the decision to admit until the actual surgery, irrespective of what happened in between. This method is quite different from the reported waiting time method used by the English Department of Health. For instance, Department of Health figures will reset the waiting time to zero if a patient does not attend or declines a reasonable offer of admission. Equally, if a patient is unwell or unfit for surgery, this time is subtracted from their waiting time. We calculated mean and median waiting times for each year and each procedure. We used t tests and Wilcoxon signed rank tests to determine whether a statistically significant difference in mean and median waiting times existed for the periods of 1997-2000, 2001-4, and 2005-7. Those three periods roughly correspond to what have been labelled as the three stages of government policy to tackle waiting times, as noted above.5 We used analysis of variance and non-parametric rank tests to determine whether a statistically significant intra-year variation in waiting times existed between fifths of deprivation. No individual patients were identifiable in this study. All data were presented in aggregate form. The Stata10-SE software package was used for statistical analysis. The total number of observations comprised 444 867 knee replacements, 423 203 hip replacements, and 2 647 235 cataract repairs. In total, 3.8% (16 856) of knee replacement observations, 3.9% (16 416) of hip replacement observations, and 3.0% (78 440) of cataract procedure observations were excluded for missing data. We excluded 734 knee replacement procedures, 534 hip replacement procedures, and 477 cataract procedures because they had waiting times greater than three years. After these amendments, the observations were limited to 427 227 knee replacements, 406 253 hip replacements, and 2 568 318 cataract repairs done in English NHS patients between 1997 and 2007. For all three procedures, mean and median waiting times rose initially and then steadily fell (fig 1⇓). However, what is of particular interest for our purposes is what happened to waiting times broken down by socioeconomic status, as measured by the Carstairs index of deprivation. Figure 2⇓ shows mean waiting times for all three procedures, broken down by deprivation. In 1997 deprivation and waiting time tended to be positively related—the greater the degree of deprivation, the longer the waiting time. 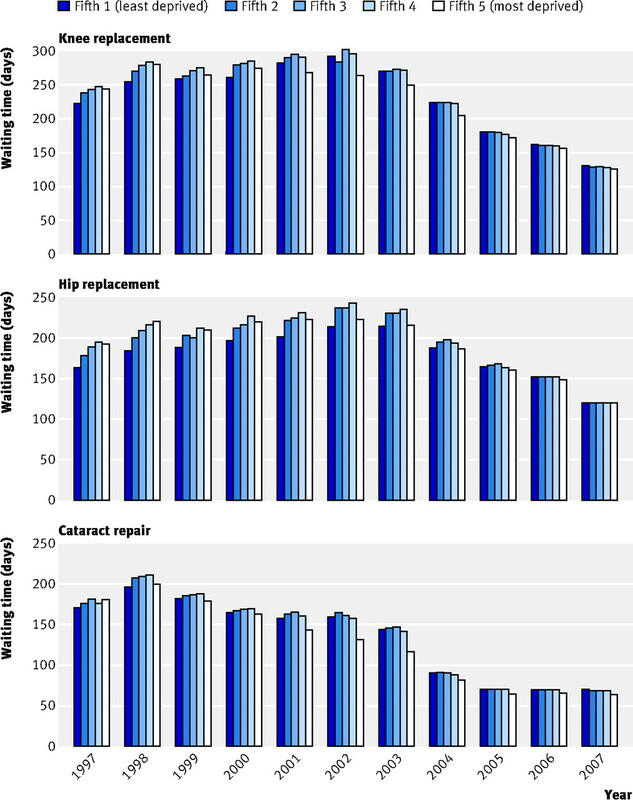 By 2007 waiting times were much more uniformly distributed across the spectrum of deprivation; for cataract repair and knee replacement, the distribution had actually reversed to show a negative relation between waiting time and deprivation. We found a statistically significant difference in waiting times for each procedure between each of our three periods (P<0.001) determined by t tests and Wilcoxon sign rank tests. Statistical significance at this level was maintained with a Bonferroni correction to account for the possibility of random events occurring over the study time period. We found a statistically significant intra-year variation in waiting times between deprivation groups for all three procedures for all years, except hip replacements in 2005 and 2006, measured with analysis of variance and Kruskal-Wallis rank tests (P<0.05). We used ordinary least squares regression to establish the relation between waiting times and fifths of deprivation over the three time periods. Tables 1⇓, 2⇓, and 3⇓ summarise the results for the three procedures. As can be seen from the β coefficients on the socioeconomic status variables for each time period, the relation between waiting times and the deprivation fifths also changed over time. Each unit increase in the β coefficient represents a one day increase in waits. For all three procedures, each successive time period was associated with a statistically significant reduction in waiting times. More interestingly, less variation in waiting times existed across socioeconomic groups over time. For example, for hip replacement surgery in 1997-2000 each successive increase in deprivation fifth was associated with a statistically significant increase in waiting time of between one and two weeks compared with the least deprived fifth (P<0.001). In 2001-4 variations in waiting times between deprivation fifths tended to be large and significant. Each procedure showed a modified U shaped distribution, with the middle fifths waiting the longest for care. In 2005-7 very little difference existed in days waited depending on patients’ deprivation fifth. 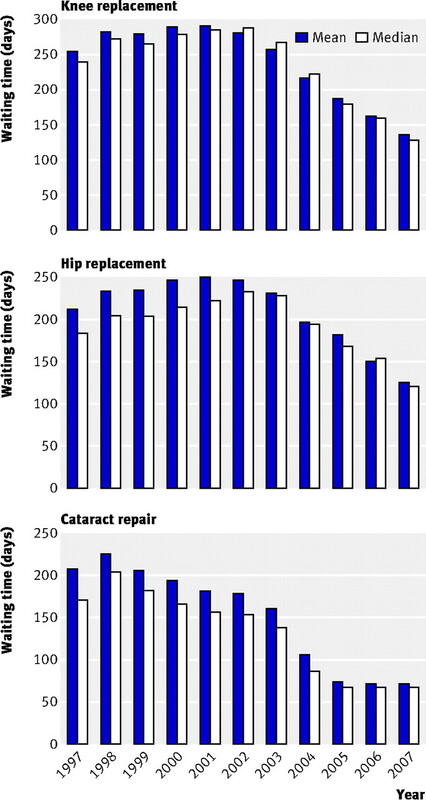 In fact, patients from the most deprived fifth having either a knee replacement or a cataract repair waited less than patients from the least deprived fifth (P<0.05). Although initial results from the pilot of choice in London suggested that little or no difference existed in the take up of choice by different social classes, no aggregate evidence has been available on whether the reforms have harmed or improved equity.21 Our results show that during the period after the reforms were introduced, waiting times for knee replacement, hip replacement, and cataract repair continued to fall and the variation in waiting times between fifths of deprivation was reduced. Hence, contrary to critics’ fears, by 2007 patients’ deprivation had little impact on their waiting times. In certain circumstances, by 2007 patients in more deprived areas were waiting less time than patients from less deprived areas. This study has several limitations. Firstly, the Carstairs index of deprivation is one of several ways of measuring socioeconomic status. Most of the indices are significantly correlated, but our measure is accurate only at the level of the output area.7 It therefore cannot pick up deprivation of individual patients but rather the deprivation level of the area in which the patient lives. Secondly, as stated, given the number of policy processes happening at the same time, proving that one element of the reforms rather than another caused either the drop in waiting times or the improvement in equity is difficult. This analysis was largely a descriptive analysis, so we have been careful not to ascribe causation. Thirdly, these data are cross sectional, and the patients’ characteristics varied from year to year depending on who was referred for care. Therefore, variation exists in our samples over time. We are unable, for instance, to determine whether patients elected to use the private sector and this loss of demand for public provision led to a decrease in waits. Although this is unlikely, it should nevertheless be taken into account. Likewise, this study looks at equity with reference to use of services not with reference to access. Fourthly, this analysis is focused on three particular surgical procedures—knee replacement, hip replacement, and cataract repair. Together, the three procedures account for between 6% and 7% of total elective surgical activity. Although we have no reason to believe that the patterns seen for these elective procedures are unique, we have no means of knowing with certainty that waiting times for all other elective surgical procedures have followed the same trends. Fifthly, this analysis relies on administrative data. Such data are relatively easy to acquire, encompass the whole English population, and are computer readable. However, possible shortcomings include data miscoding, missing data, and few measures of process quality. However, missing data or miscoding would be unlikely to lead to the clear, consistent, and statistically significant results that we have observed. We thank the Dr Foster Unit at Imperial College London for processing the data. We also thank Gordon Hart for his contribution to constructing the original dataset and comments on earlier drafts of this manuscript. Contributions: ZNC had the original idea for the study. SJ obtained and cleaned the data. ZNC wrote the first draft of the paper and wrote subsequent drafts after feedback from the other three authors. All four authors contributed to the study design and the interpretation of the results and gave final approval. ZNC, AMcG, and JLG are the guarantors. Funding: This research was funded through an LSE doctoral studentship and a Morris Finer PhD fellowship. Competing interests: JLG worked part time in the Policy Directorate at No 10 Downing Street from October 2003 to June 2004 and full time from June 2004 until August 2005. He was seconded from his position at the London School of Economics and continued to receive the same salary and pension contributions as at the LSE. His roles at No 10 included assessing inequities in use of services within the NHS and discussing the possible impact on equity of the government’s reforms on choice. He also advised on the rolling-out of the government’ reform policies; the policies themselves pre-dated his appointment. The work consisted of advising the prime minister and other members of the government on health service issues, assembling research evidence as required, discussions with stakeholders, helping with the intellectual content of speeches, and working with civil servants on implementing the reforms. Martin R, Sterne J, Gunnell D, Ebrahim S, Smith GD, Frankel S. NHS waiting lists and evidence of national or local failure: analysis of health service data. BMJ2003;326:188-98. Appleby J, Harrison A, Devlin N. What is the real cost of more patient choice? London: King’s Fund, 2003. Oliver A, Evans J. The paradox of promoting choice in a collectivist system. J Med Ethics2005;31:187. Barr D, Fenton L, Blane D. The claim for patient choice and equity. J Med Ethics2008;34:271-4. Appleby J, Harrison A. The war on waiting for hospital treatment. London: King’s Fund, 2005. Klein R. The troubled transformation of Britain’s National Health Service. N Engl J Med2006;355:409-15. Morgan O, Baker A. Measuring deprivation in England and Wales using 2001 Carstairs scores. Health Stat Q2006;(31):28-33. Pell J, Pell A, Norrie J, Ford I, Cobbe S. Effect of socioeconomic deprivation on waiting time for cardiac surgery: retrospective cohort study. BMJ2000;321:15-8. Siciliani L, Martin S. An empirical analysis of the impact of choice on waiting times. Health Econ2007;16:763-79. Waiting for Dobbo. Economist May 23 1998:51-2. Bevan G, Hood C. Have targets improved performance in the English NHS? BMJ2006;332:419-22. Secretary of State for Health. The NHS plan: a plan for investment, a plan for reform. London: Department of Health, 2000. Stevens S. Reform strategies for the English NHS. Health Aff2004;23(3):39-44. Department of Health. Building on the best: choice, responsiveness and equity in the NHS. Norwich: HMSO, 2003. Department of Health. Health reform in England: update and next steps. London: Department of Health, 2005. Dixon A, Le Grand J. Is greater patient choice consistent with equity? The case of the English NHS. J Health Serv Res Policy2006;11:162-6. Stevens S. Equity and choice: can the NHS offer both? In: Oliver AJ, ed. Equity in health and health care: views from ethics, economics and political science proceedings from the meeting of the Healthcare Equity Network. London: Nuffield Trust, 2003. Siciliani L, Hurst J. Tackling excessive waiting times for elective surgery: a comparative analysis of policies in 12 OECD countries. Health Policy2005;72:201-15. Coulter A, le Maistre N, Henderson L. Patients’ experience of choosing where to undergo surgical treatment: evaluation of the London patient choice scheme. London: Picker Institute, 2005. Department of Health. High quality care for all: NHS next stage review final report. London: Department of Health, 2008.